NFL commissioner Roger Goodell spoke at a charity dinner Tuesday night at Ford Field and stated the NFL didn't suspend Lions' defensive tackle Ndamukong Suh for kicking Houston QB Matt Schaub in the groin Thanksgiving Day because "intent" was difficult to determine in this case. Was it inadvertent? Many people are suspicious because Suh has gained a reputation for crossing the line for rugged play. But he either did it intentionally or he didn't (Suh denied he did so intentionally Wednesday). If the league can't determine whether it was intentional or not, why is Suh being fined $30,000? It's not like hockey where "he must control his stick." His foot came up while his face was buried in the turf. Fining Suh, but not suspending him is the ultimate cop out by the league. 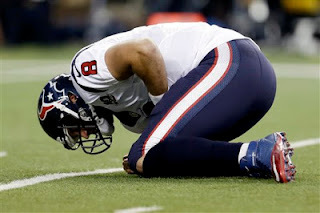 What are they doing, appeasing Schaub, who has whined a couple times about the play after going to his knees with theatrics that were straight out of FIFA? Or the television commentators on the national broadcast, who used the opportunity to blast Suh? While Suh's general demeanor is increasingly and justifiably becoming a source of consternation in this town (he is a living, breathing contradiction on a number of fronts, and his production on the field the last two years has hardly merited the star status he receives nationally with media and various endorsements), he either kicked Schaub intentionally or he didn't. 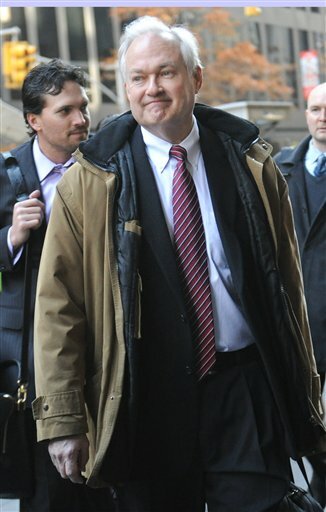 If intent can't be determined, he shouldn't be punished at all. Replay of my live video chat on Lions, Michigan, Pistons and Birmingham Brother Rice football coach All Fracassa. - That was the worst call I've ever seen in the NFL. Worse than Packers-Seattle game with the replacement refs, ect. Justin Forsett was tackled. Period. It was idiotic to not make that play subject to review, too. The explantion of why it wasn't reviewable is a joke. It should be automatic because it is a TD. It should not matter if the Lions threw the challenge flag. What? Get the call wrong because of some stupid technicality? Awful. And making matters even worse for the powers to be in the NFL is it happened during a thrilling game on Thanksgiving Day with the entire nation watching. Brutal. But the Lions can't lean on that call for an excuse. Quality teams overcome such adversity. The Lions didn't respond with a good drive after it, and it was disappointing. - Detroit defensive end Cliff Avril is starting to make plays. He forced a fumble in the first half. He got his second sack in as many weeks in the third quarter. He has 6.5 sacks, which puts Avril roughly on the same pace to equal last season's output of 11 sacks. 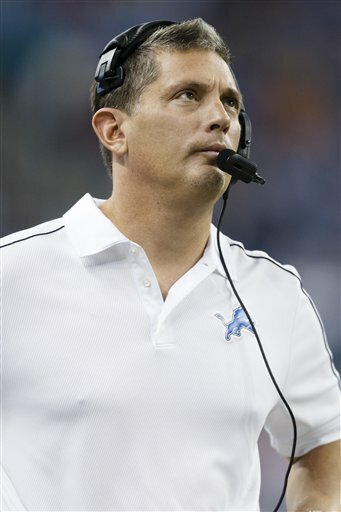 - That was an absolute waste of a timeout by the Lions before Jason Hanson's field goal in the third quarter. In a shootout type of game like this, it could comeback to haunt them. Little things like that are very hurtful in the NFL where the margin for error is slim most weeks. - For all the complaints about Lions' QB Matthew Stafford throwing sidearm, which I think is justified, he made a great sidearm pass while on the run to tight end Brandon Pettigrew for a first down to set up the Lions' second touchdown. 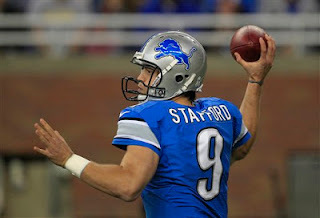 - It wouldn't surprise me if Stafford throws for close to 500 yards today. The Texans secondary is serious bad without premier cornerback Johnathan Joseph. - Wide receiver Mike Thomas has pretty good speed, and looks like a good addition for the Lions. He is making the most of his increased playing time today. That was a key TD reception in the second quarter. It makes you wonder what the Jaguars, who are dreadful, were thinking by unloading the guy. At first glance, second-year WR Titus Young, sent home this week for disciplinary reasons, should be nervous. The Lions may not need him that badly if the first half of this game is any indication. Certainly, Ryan Broyles has looked better than Young for all this season, with the Seattle game(Young's one good game) being the lone exception. - Lions' cornerback Chris Houston's ball skills, which were reputedly poor when he was with Atlanta, have been much better than advertised during this stint with the Lions. However, that was not the case on Texans' wide receiver Andre Johnson's 43-yard reception, setting up Houston's second TD. The ball was slightly underthrown by QB Matt Schaub, and Houston was right there. He just didn't make the play when the ball was in the air. I'll say this, Houston can run with any receiver. - Remember when linebacker was a glaring weakness for the Lions? It isn't at this point. Detroit's linebackers are playing well so far today, and have, for the most part, been solid this season. - Finally, the Lions put together a long drive to start a game and finished it with a touchdown. Quarterback Matthew Stafford made a brilliant throw on third and long to rookie wide receiver Ryan Broyles for a first down. There was a very good diving catch by Calvin Johnson on the drive, too.Then, the dominos fell. Not playing from behind is an obvious key for the Lions today. With Arian Foster at running back and a solid zone blocking scheme, the Texans will be able to work the clock if in front. Houston is clearly vulnerable in the secondary, though, with Johnathan Joseph, one of the best cover cornerbacks in the league, out with a hamstring injury. His replacement, Alan Ball, is more of a special teams player. Also, Kareem Jackson, the Texans' other starting cornerback, was scorched last week by Jacksonville backup QB Chad Henne. He had played well previously this season, however. - Defensive tackle Nick Fairley continues to make progress. It looks like he is in better shape and quicker than early this season. He has certainly been much more active lately. - The Lions have gotten away with third and long to start a couple of their drives so far today, but they must avoid that situation the rest of the day if they are going to be successful. - J.J. Watt, sinply put, is a beast. We've already seen that today. - Penalties continue to hinder the Lions. Sometimes, it is ridiculous. - The good news for former Michigan State wide receiver and Westland John Glenn star Keshawn Martin is he has found a niche as the Texans' primary kick returner. The bad news for Keshawn Martin is he took an absolutely foolish misconduct penalty in the first quarter. The officials, you could tell, just wanted to look away from it, but Martin kept carrying on for no reason. He is averaging 15 yards per punt return this year, including breaking loose on a 71-yarder. The potential is there, for sure, but there might be a maturity issue that needs to be corrected. In the past, when the Big Ten expanded, it was about adding elite programs to the stable. Penn State and Nebraska had national championship pedigrees in football.Market-size was a secondary issue. There isn't nearly as much "wow" appeal with Maryland and Rutgers athletically. Rutgers, in particular, raises eyebrows and questions about whether the Big Ten is dropping its standards. 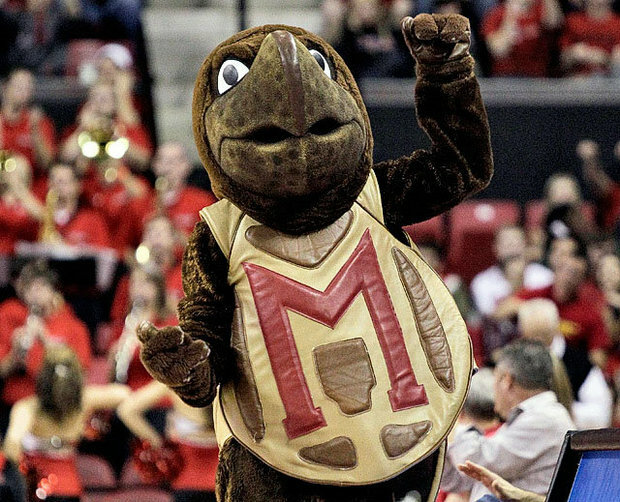 Maryland has an excellent basketball tradition. It would be the most recent team in the Big Ten to win the NCAA tournament. Rutgers presents little in that regard, and figures to field second-division teams in both revenue producing sports perpetually. But this isn't about sports, nor academics (both schools are solid in that regard), as much as demographics, and is actually a wise move by the Big Ten. There is one major college athletic program in the immediate vicinity of New York City: It is Rutgers. New York is not a place where college sports are revered like the Midwest, but the nation's No.1 media market by far is a good thing to be a part of (the campus is a 50-minute drive to New York City) in an era Super Conferences are inevitable. Maryland is located within 30-minute drive to Washington D.C. and is 40 minutes to Baltimore. Combined, those two media markets are roughly the size of Chicago's, which is the largest media market currently in the Big Ten. It allows the Big Ten more juice when negotiating with major networks, and will help grow its own Big Ten Network. - Calvin Johnson's brilliance is sometimes difficult to comprehend. The 25-yard pass he caught from Matthew Stafford made Packers' safety Morgan Burnett look silly. Burnett is a good player, but that play was an example why Johnson is the best non-quarterback in the NFL. Defenses stack the deck against him. He still succeeds. - It is difficult to not look at the fourth quarter of this football game and not see the Lions' season the line. At 5-5, they'd still have a fighting chance. At 4-6, the situation goes from percarious to dire. - When Nick Fairley made a tackle for loss to end the quarter, fans started chanting "Suh." While Suh is playing well today, Fairley is playing better. This is what this town envisioned when the Lions selected Fairley 13th overall in the 2011 NFL Draft. - First it was Minnesota's Josh Robinson. Now it is Casey Hayward. The rookie cornerback for the Green Bay Packers from Vanderbilt, who is tied for the NFL lead in interceptions with five after picking off Lions' QB Matthew Stafford in the second quarter Sunday, was taken in the second round with the 62nd overall pick of April's NFL Draft, eight picks after Detroit selected wide receiver Ryan Broyles. We'll see how the Broyles' pick works out long term, but in the short term, it sure hasn't, considering the cornerbacks the Lions bypassed, who are having success with their NFC North rivals. 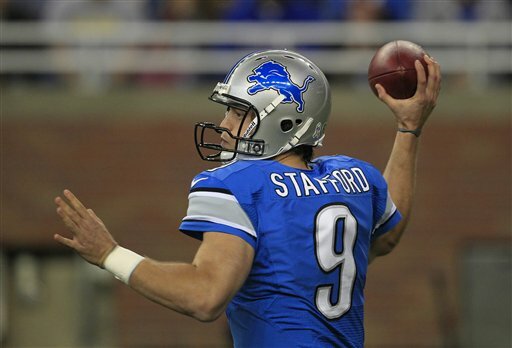 - Stafford plus a sidearm throw equals a recipe for disaster. - The Lions' defensive line outplayed the Packers' offensive line in the half. It has been the biggest factor in the game so far. In 2010, when the Lions beat the Packers at Ford Field, that was also the case. It has made the Lions' flaws in the secondary less glaring, Packers' quarterback Aaron Rodgers hasn't been sacked a lot, but he has been hurried. Nick Fairley and Ndamukong Suh have been especially effective for the Lions so far today. 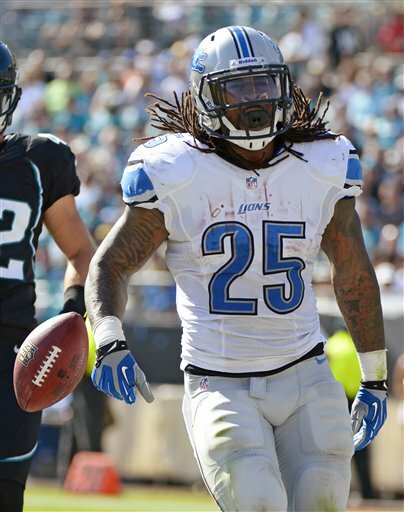 - Running the ball proved to be the key for the Lions once they got into the scoring zone. They spread the field and ran up the middle. No problem. - The Lions have their share of issues. I don't believe running back is one of them, Mikel Leshoure is running hard and displaying good speed today.The Lions are averaging more than four yards per rushing attempt. They just don't run the ball as often as other teams. Not all of it is offensive strategy. A lot of it has to do with the scoreboard. The Lions have been playing from behind most of this season. - If Stafford doesn't take better care of the ball in the second half, the Lions have little chance of winning this game. That's the bottom line. - What Calvin Johnson does far better than any receiver the Lions have ever had, by far, is beat double coverage deep. The Packers did have a safety defending him over the top. He beat the coverage anyway. It was also a very accurate deep throw by Detroit quarterback Matthew Stafford. - While flipping a field position game that was bound to doom the Lions sooner instead of later, settling for a field goal after such a great play was profoundly disappointing. It summed up the Lions problems during the first half of games most of the season. They are surprisingly inept in the so-called "red zone" given the amount of legitimate weapons they feature offensively. 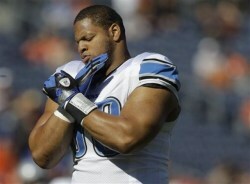 - The Lions using Ndamukong Suh at defensive end more today is a smart move. He's already made a couple tackles. Maybe he will make a big play or two. Logic dictates Suh is going to be more difficult to block if he is a moving target. He isn't lacking the quickness to take some snaps at end. - I didn't notice it that much while doing my radio show from the Atrium this morning, but there is a contingent of Packers fans here today, although it isn't as large as usual. They are very loud, though. It has only spurred on Lions' fans to be louder than usual to drown them out. The noise level was amazing on the failed fourth-down try on the Packers' second drive of the quarter. Michigan Wolverines ready to bring on "Ohio"
- Michigan's performance couldn't be more impressive than today. It is remindful of the Illinois' game earlier this season because it's difficult to determine if it is because the Wolverines are so good, or the opposition so bad. We know this, Michigan needs a Minnesota upset of Nebraska today because it seems unlikely they will get any help from Iowa next week. - Denard Robinson's catch and run late in the third quarter showed what he would be like as a kick returner in the NFL. He is amazingly elusive in the open field. He will run a blazing 40-yard dash time at the NFL combine. That speed will get him drafted. - Devin Gardner is throwing the ball exceptionally well today, better than his first two starts. He is hardly getting any pressure and is taking full advantage. His deep throw to Jeremy Gallon was excellent. - Kirk Ferentz, Iowa's coach, has proven himself down through years, but the Hawkeyes' talent level is really down. That is especially true up front defensively. Usually, Iowa's front seven is very strong. Michigan's offensive line is dominating the line of scrimmage today. Gardner literally has all day to throw. The run blocking has been stellar. Neither one of those factors is normally the case for the Wolverines. I had wondered how Iowa lost to Indiana. Now I understand why. 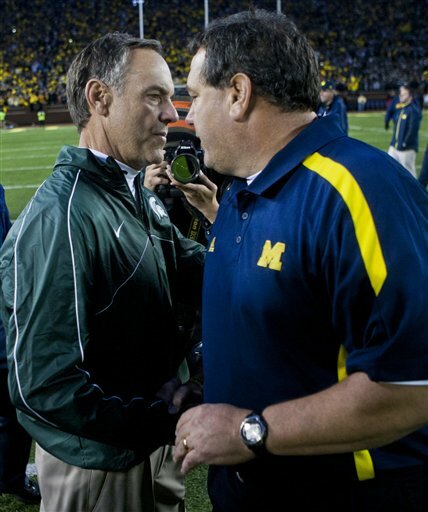 What I can';t figure out is how Michigan State lost at home to this team. The Wolverines are just toying with these guys. - Michigan offensive coordinator Al Borges, mad scientist? Not really. 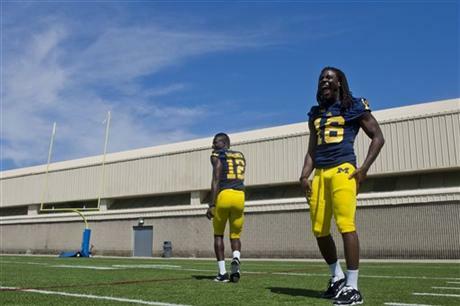 Putting Denard Robinson at running back was a good idea to get him on the field today. Obviously, he is still having injury issues when it comes to throwing the football. It's senior day. The idea of Robinson coming from another direction is just one more thing Ohio State must prepare for and be concerned about next week. And it's Senior Day - Robinson's last chance to play at Michigan Stadium. It's all good. - Iowa presents the complete opposite scenarnio offensively compared to Northwestern last week. There is a noticeable lack of speed at offensive skill positions, but the Hawkeyes did an excellent job of inching their way down the field on a long touchdown drive in the quarter. No quarterback I can ever remember in this state, whether it be college or NFL, has ever been judged by a more unfair standard than Michigan's Denard Robinson. He has led his team to victories over Notre Dame (twice), Nebraska in his only meeting, Ohio State after a long drought by the Wolverines, Michigan State by making a couple clutch plays at the end and a BCS bowl. "He is a great athlete, but he is not a quarterback." I have heard that said literally 1,000 times from fans and various members of the media, as if they are mesmerized by the same delusional spell. Robinson got hurt. He didn't play vs. Minnesota and Northwestern. Devin Gardner did a good in his place. All of a sudden he is a better QB than Robinson, and certainly a better passer. Well, the facts don't bear that out, especially when it is considered Roy Roundtree made a bale out catch to save Michigan vs. Northwestern, and spare Gardner being blamed because his earlier interception almost ended a chance for a Michigan comeback. This is what Robinson did last season vs. Northwestern: 17-of-26 passing for 337 yards and two touchdowns. It was a road game. Michigan fell behind by 10 points in the first half when Robinson was intercepted three times. In the second half, he was brilliant as a passer, completing tosses of 57 and 48 yards. He ran for 117 yards in that game, too. Michigan won it 42-24. He played far better vs. Northwestern on the road than Gardner did vs. the Wildcats at home this year - but nobody remembers. And it’s like everybody forgot what Robinson did passing the ball vs. Minnesota last season. He completed his first 11 passes in a 58-0 rout. He ended up 15-of-19 passing for 169 yards .He didn’t run much that day. He didn't have to. This isn't meant to dismiss Gardner. There is no question he proving he should be Michigan's QB to open next season. It's just to point out he is being judged by a much fairer standard than Robinson as a passer. His numbers vs. Minnesota and Northwesten were good: 12-18, 234 yards vs. Minnesota, 16-29 for 286 yards vs. Northwestern. He had two touchdown passes and an interception in each game. But against the same competition. Robinson was better. Under normal circumstances, I'd be questioning the Tigers signing a 37-year-old outfielder who will be 38 by the time the postseason rolls around next October. Baseball players prime years are 27-to-33. They tend to slow down after that. And when it happens, the descent is often rapid, and difficult to see when it is exactly coming. We've been through it a few times here in Detroit. Gary Sheffield couldn't recap the magic. Magglio Ordonez was great one season, a fading star the next. Johnny Damon was an $8 million waste of money. 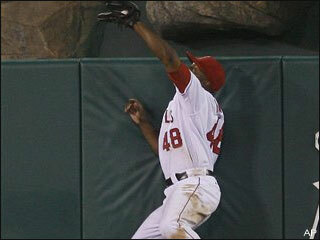 But Torii Hunter is different. He is worth the risk. It's just a two-year deal. A $13 million per season salary is reasonable. He did hit .340 with a high OPS against left-handers last season. He was a Gold Glove winning center fielder who has moved to right field and performed exceptionally well defensively there. He is a run producer, whose right-handed bat was every bit as quick last year as it has been in the past. He is a ultimate character player, who will fit in perfectly in an already good clubhouse. And if he does hit the wall of the age, there is some flexibility because the deal isn't long term. He is a free agent signing. The Tigers didn't have to trade one of their prospect trading chips to fill their most glaring need. They still have them for a possible deadline trade in July. 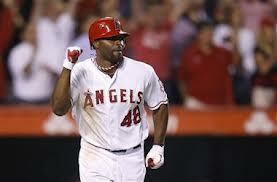 - Torii Hunter is a different type of player than Angel Pagan. He is a run producer, not a table setter. Pagan (31 and turning 32 in July) is in his prime while Hunter 37 turning 38 in July) is older. Yet, Hunter, unless he suddenly runs into an age wall, is much more threatening in the batter's box than Pagan. There was a lot of fretting among Tigers fans last season about "setting the table" for Miguel Cabrera and Prince Fielder. In truth, the Tigers biggest issue is they didn't have enough consistency throughout their lineup. They were too dependent on their two big guns to produce runs. As good as they are, Cabrera and Fielder are going to have dry spells. It's why when Delmon Young would gone on a roll, it would be so noticeable. Hunter, along with the return of Victor Martinez, would give the Tigers more consistent run producing throughout the lineup. Pagan is a good fielder, but Hunter is exceptional. He is as good a right fielder as he was in center, and is much better option for the Tigers in center than their current cast should something happen to Austin Jackson. His leadership qualities are among the best in the game. There are few players as respected. The biggest is factor, however, is the right-handed hitting Hunter is a much better hitter against left-handed pitching than Pagan, who is a switch hitter. Against left-handed pitching last season, Hunter hit .340 with a .868 OPS (on base plus slugging percentage). Hunter is a .289 hitter in his career vs. lefties with a .843 OPS. 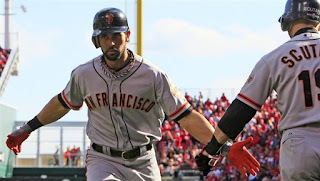 Pagan hit .271 with an .736 OPS vs. left-handers in 2012. His career mark vs. lefties is .259 with a .710 OPS. The Tigers struggles against left-handed pitching, of course, are well documented and really came to head during the World Series. 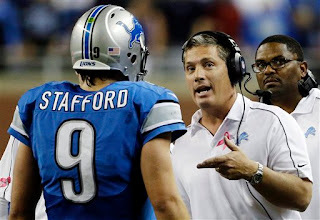 - Finally, the Lions got a big play offensively. Those bemoaning Calvin Johnson's lack of production this season are misguided. Yes, he should have more touchdown passes, and is banged up, but he is still very productive despite double teams. He has gone over 100 yards in five of the Lions' first first nine games this season, and had 94 in another. - The Lions pass rush needs to be better. Even Christian Ponder will pick apart a defense if he is given enough time. If Cliff Avril remains out of this game, the Lions will miss him. Both he and Ndamukong Suh have applied pressure.That's the bad news. The good news: The Lions red zone defense has been stellar and it is the only reason they are in this game. - The type of hit Johnson took from Vikings' Harrison Smith on the long pass that set up the Lions first touchdown is the type the league needs to look at to protect receivers. Johnson was in a defenseless spot. Smith's helmet was lowered. It was delivered at or near the head. Johnson was shaken up after the play. - It's difficult to watch the Vikings and not be impressed with tight end Kyle Rudolph. He is an excellent player. -The idea playing against the Vikings is simple: If they fall behind, and they are forced to put the ball in quarterback Christian Ponder's hands throwing to pedestrian wide receivers (with Percy Harvin out), the Vikings' chances of winning are minimal. Give the Vikings a lead, with a great back, Adrian Peterson, pounding into the line play after play, and running down the clock, their chances of winning grew greatly. As such, the Lions have put themselves in a precarious situation by trailing at halftime of this game. - Other than allowing one big play in the first quarter, the Lions' defense has played relatively well. The defensive line has imposed its will a couple times. If could be worse if the Vikings had converted touchdowns when they settled for field goals. - In the category of rookie mistakes: Lions running back Joique Bell not getting out of bounds near the end of the half. The Vikings gave the Lions the ball back with nearly a minute left in the half, but it turned out to be a wasted opportunity. It might not have been if Bell has gotten to the sidelines instead of turning up the field on the initial pass of the drive. - The Vikings linebackers are playing exceptionally well in this game. Jasper Brinkley and Chad Greenway have stood out so far. Minnesota's defensive line is winning the fight with the Lions' offensive line, too. Stafford has been hurried on too many of his throws. He has definitely been taken out of his comfort zone. The Vikings' defense is whipping the Lions offense. That is the bottom line in this game so far. - It's one thing to get beaten deep by Percy Harvin, it's another to get smoked by Jarius Wright. Christian Ponder to Jarius Wright? Ponder didn't even throw for 100 yards the last couple weeks. Wright was a solid college player at Arkansas, a fourth-round draft pick. But how he got that open deep down the field is a mystery. Ponder did buy some time by side-stepping the Lions' pass rush, but he didn't buy that much time. It was ridiculous. 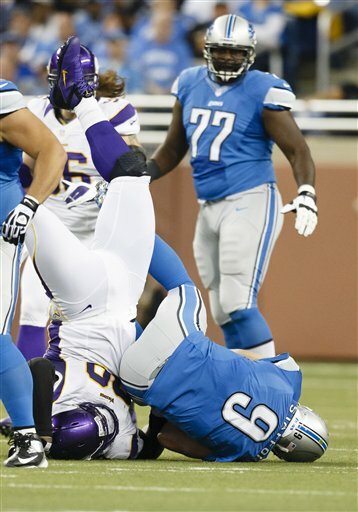 - That was horrible throw by Matthew Stafford on Chad Greenway's interception. Throwing sidearm down the field while peddling backward is an invitation to disaster on any pass other than a screen. The Lions defense played well in reaction to the turnover. That was a great play by DE Cliff Avril on the first play following the change of possession. The Lions are fortunate; they were facing a 14-0 hole after Greenway's pick - 10-0 is more reasonable. Stafford has not been sharp today. Running back Joique Bell dropped a short pass from Stafford in the flat, but it wasn't necessarily his fault. The ball was thrown behind Bell. These are some of the issues that plagued Stafford during the first three quarters of several games the first half of this season, but not so much the previous two weeks when the Lions' offense did do well in the first half of games vs. Seattle and at Jacksonville. Stafford last couple throws were much better. - Lions defensive tackle Nick Fairley is playing very well today. That was the best quarter he has played in the NFL so far. - Pat Fitzgerald went to Northwestern and was a star linebacker. Chicago is a great town and Northwestern is a tremendous school and place. But it's difficult to win there in revenue sports such as football and basketball. It's just the way it has been for nearly a half a century. But it's very difficult to watch this game and not come away impressed with just how well-coached the Wildcats are. You also can't help but wonder what Fitzgerald would do at a school where the deck isn't stacked against him like it is in Evanston. - Finally, Michigan made a couple plays defensively. They needed to stretch the field vertically. That was more a good catch by Jeremy Gallon than throw by Devin Gardner on the long completion. The pass was underthown, or it would have gone for a touchdown. Gardner did make an excellent play-fake on the play. - Fitzgerald Toussaint has made a couple big plays today. A 50-yard run in the first half was followed up by making a couple defenders miss in the open field on the Wolverines' third touchdown. It's about time he woke up. It has been rough season for him in comparison to 2011. - It was a disappointing drive at the end of the half for the Wolverines' defense. Northwestern backup QB Trevor Siemian is an excellent passer, though. He'd start on a lot of teams, and the Wildcats do an excellent job of using him in passing situations, particularly the two-minute drill. Northwestern is a very difficult team to prepare for because their offense is so diverse. - Michigan's defense wasn't particularly stout last season, but it was opportunistic. It has been more stout this season, but the turnovers haven't been present. That was a good sign the Wolverines forced a Northwestern turnover in the second quarter. It's an even better sign the Wolverines were able to take advantage of the shortened field to score a touchdown. - Northwestern has had excellent backs and receivers down through the years, but I don't remember the Wildcats with quite this much speed overall offensively. Quarterback Kain Colter and running back Venric Mack are quicker in person than the perception I had before from watching them on television. Defensively, it's a different story. Northwestern is neither big nor fast overall. - Brady Hoke has done a very job recruiting, but he clearly needs to focus more on receivers and running backs. The line on both sides of the ball, the secondary and linebackers should be fine, but Hoke has not recruited enough big play threats at skill positions offensively. Derrick Green, the five-star running back from Virginia the Wolverines are in on, might hold the key to the Wolverines 2013 recruiting class. They need a premier back badly. - The issue in this game is not Michigan's offense. The Wolverines were going to score a lot of points in this game whether Devin Gardner or Denard Robinson is at QB. 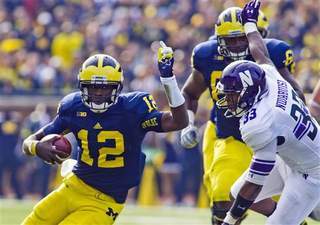 The big issue today is whether the Wolverines' defense can stop Northwestern's offense. The answer on the first drive wasn't a good one for the Wolverines. We'll see how it develops. Northwestern's second drive went better for Michigan's defense. This game has all the makings of a classic shootout. - I do like Gardner's pocket awareness. He is definitely playing like a four-star recruit since being given opportunity, and is making a clear case for being the Wolverines' starting QB next season. - Roy Roundtree is playing better. The Wolverines need him to perform more like he has in the past compared to this season. 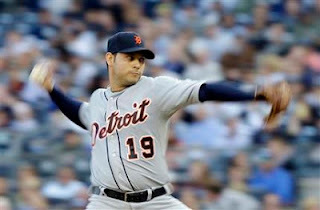 Re-signing Anibal Sanchez would help the Tigers, but at what cost? - Finally, a halftime lead. - The second quarter is indicative of what the Lions are capable of when they get on a roll. They are one of those teams that can get very hot offensively. After a mostly sputtering first-half of this season, perhaps the Lions are heating up. They have a lot of weapons on offense. They are using them all today, including getting the ball into the hands of Calvin Johnson earlier in the game. The running attack is looking better. The offensive line is playing well. - The Lions have been exceptionally stout defensively today, but they should be. The Jaguars offense is one of the worst in the NFL, especially without running back Maurice Jones-Drew. The Jaguars have to put the ball into the hands of QB Blaine Gabbert. It's not exactly an ominous thought, is it? - Each game Ryan Broyles contributes more to the Lions' offense. He is rapidly becoming a productive player. That was a big catch on the Lions third TD drive by Titus Young, too. - This isn't Lions quarterback Mathew Stafford's most spectacular performance, but it is one of his more efficient. He is, simply, doing what is necessary to win this football game, and it appears no theatrics are going to be needed this time. 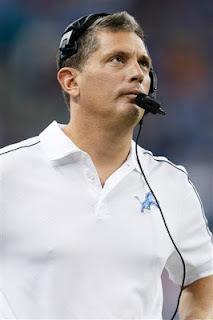 - If there was ever a team that needs to win in a rout, it is the Lions. The Jaguars are awful, but the Lions deserve credit for going to Jacksonville and taking care of business. It was an excellent first half. - Granted, field position hasn't been in their favor, but another first quarter with no production offensively. Better starts are a necessity for the the Lions moving forward. They should be toasting this secondary. It's not that good to begin with, and is injury depleted. - The 14-yard run near the end of the quarter by Mikel Leshoure was encouraging for the Lions. The running game has been sputtering. But his slip at the end of the quarter wasn't so good. - The defense needs to make a play or two. It has been stout, but the Lions have not been winning the turnover battle, which was so important to their 5-0 start last season. - The Spartans' offense is so plodding, it's painful. That this is one of MSU's better offensive performances of the season speaks volumes about the Spartans' issues. The Spartans were baled out by a terrible call on a alleged hit out of bounds on the final drive of the quarter. - Honestly, I have never been impressed with Spartans running back Nick Hill, but there is no question he provided an excellent change of pace today when he replaced Le'Veon Bell to start the third quarter. It keyed the Spartans go-ahead field goal. - The Spartans defense did a wonderful job of forcing Nebraska into a 3-and-out after Bell fumbled the ball midway through the quarter. It could prove to be the turning point of the game. I still believe State's defense has been overrated this season. It was, after all, supposed to be among the best in the nation. It isn't. Too many times, it hasn't made important stops when necessary. But it is still solid. - One factor noticeable in this game is that Nebraska has much more speed on offense than MSU has on offense. The Spartans' Le'Veon Bell does most everything well, and is defnitely a premier college running, but his lack of breakaway speed sticks out. Even MSU wide receiverTony Lippett's long TD reception in the quarter wasn't because of separation from defenders. He won a jump ball with three Nebraska players on the score. On the other hand, when Nebraska QB Taylor Martinez broke loose in the open field, he was gone. 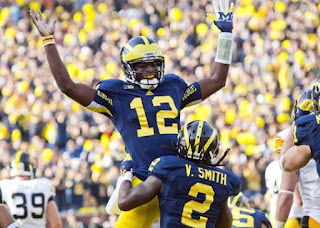 - It's amazing how much more effective Martinez is running Nebraska's offense than Michigan's Denard Robinson. Last season, though, MSU's defense did a do a good job against Martinez, holding him to 23 yards rushing and 80 passing, despite a 24-3 Nebraska victory. Today has presented a much different story. Martinez had runs of 71 and 59 yards during the first half. That's ridiculous. - Giving up big plays like it has, MSU is fortunate this game is tied. - Getting a touchdown in the first quarter has been unusual for the Spartans. It was an impressive drive. There does seem to be a carryover from late in the Wisconsin game, when MSU's offense finally pulled together. - Taylor Martinez is an explosive college QB with outstanding big-play capability, but it is more than negated by his inconsistency. That was a beyond horrible throw he made on the interception by MSU safety Kurtis Drummond. Then, he made up for it with a 59-yard run to set up Nebraska's TD. Typical. - Nebraska's Rex Burkhead, out with a knee injury, is a terrific running back, but his replacement, Ameer Abdullach, has tremendous quickness and is definitely more threatening to the Spartans' defense in that way. He has been able to break contain to the outside a couple times already. - There are empty seats at Spartan Stadium today, which is disappointing considering this is the first time Nebraska has visited East Lansing as a member of the Big Ten.